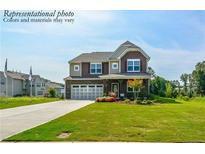 Find Clover, SC New Homes for sale. View Photos, Maps and MLS Data Now! Oaks At Clover - Quality finishes in the kitchen with granite countertops, stainless appliances, and painted maple cabinets! MLS#3491494. TLS Realty LLC. Glass front door, 1st floor hardwood throughout, Open Kitchen with 36” by 42” castled cabinets with crown molding, 9” deep sink with Moen Goose neck Faucet, Granite counter tops, ceramic tile back splash, Pendent lights, stainless steel appliances w/ Gas range, Wrought iron spindles on 1st floor, crown molding in foyer and dining room, Fire place, ceramic tile in bathrooms, Master bath w/ glass enclosed shower & separate garden tub and MUCH more! MLS#3490574. Lennar Sales Corp. This is by far one of our best selling OPEN floor plans! REPRESENTATIVE PHOTOS MLS#3490562. DR Horton Inc.
High design was in mind when picking the finishes; site finished hardwoods, granite, elaborate tile work, coffered ceiling, fiber cement siding, custom cabinetry & so much more! MLS#3489319. Allen Tate Lake Wylie. Oaks At Clover - Upstairs features master suite with private master bath and sitting area plus 3 secondary bedrooms with shared hall bath. MLS#3487017. TLS Realty LLC. Site finished hardwood floors, stone fireplace, coffered ceiling, dovetail joints & slow close doors & drawers in the custom cabinetry, 16 inch on center site built framing, elegant tile work in all the wet areas, granite, upgraded lighting, Rinnai tankless water heater, over sized garage, and so much more! MLS#3481840. Allen Tate Lake Wylie. Somerset At Autumn Cove - The master bath has a beautiful shower with a bench seat and semi-frameless door. Come visit today! MLS#3481377. Eastwood Homes. Somerset At Autumn Cove - The oak tread stairs lead to a loft and three bedrooms, including the master with a tray ceiling and bathroom with a garden tub and separate shower. Come visit today! MLS#3481284. Eastwood Homes. Oaks At Clover - Spacious secondary bedrooms, large cul de sac lot, fresh two tone paint elevates this house into a HOME! MLS#3478709. TLS Realty LLC. Oaks At Clover - Upstairs Game Room offers additional entertaining space or play room! MLS#3477823. TLS Realty LLC. Oaks At Clover - Second Floor Game Room offers additional entertaining space! MLS#3477310. TLS Realty LLC. Oaks At Clover - Nicely appointed with two tone paint, granite countertops, and stainless appliances. MLS#3476170. TLS Realty LLC. Somerset At Autumn Cove - Come see this wonderful home today! MLS#3474769. Eastwood Homes. From the outside through the inside & all the small details in between this one has it all; site finished beautifully laid hardwoods, stone fireplace, coffered ceiling, dovetail joints & slow close doors & drawers in the custom cabinetry, 16 inch on center site built framing, elegant tile work in all the wet areas, granite, upgraded lighting, Rinnai tankless water heater, large deck overlooking backyard, over sized garage, and so much more! MLS#3474560. Allen Tate Lake Wylie. Tullamore - Home Will Come With Individual Hers Rating Certificate And A 10yr Structural Warranty. MLS#3474099. Essex Homes Southeast NC Inc. Fantastic entertainers/chef Kitchen w/huge quartz waterfall island,double ovens, lots of counter space, walk in pantry, open floor plan, tons of windows, 10 foot ceilings down + 9 foot ceilings up,beautiful hardwood floors throughout, rich crown molding, large living room w/fireplace, formal dining room, office w/glass doors, separate mini office, drop zone, guest suite on main w/its own full bath.Upper level boasts spacious master suite w/private entrance to second floor enclosed screened covered deck, impressive spa like master bath with huge walk in closet.Two large bonus rooms which would be great for a rec room,movie room, or play areas.One of the bonus rooms also leads to the covered second story deck.Community features pool,playground & waterfront park.Great Lake Wylie location less than 5 minutes to Buster Boyd Bridge + low SC taxes! MLS#3473131. Keller Williams Fort Mill. Glass front door, 1st floor hardwood throughout, Open Kitchen with 36” by 42” castled cabinets with crown molding, 9” deep sink with Moen Goose neck Faucet, Granite counter tops, ceramic tile back splash, Pendent lights, stainless steel appliances w/ Gas range, Wrought iron spindles on 1st floor, crown molding in foyer and dining room, Fire place, ceramic tile in bathrooms, Master bath w/ glass enclosed shower & separate garden tub and MUCH more! MLS#3473427. Lennar Sales Corp.
1st floor LVP throughout, 36” by 42” castled cabinets with crown molding, 9” deep sink with Moen Goose neck Faucet, Granite counter tops, ceramic tile back splash, Pendent lights, stainless steel appliances w/ Gas range, Wrought iron spindles on 1st floor, crown molding in foyer and dining room, Fire place, ceramic tile in bathrooms, Master bath w/ glass enclosed shower & separate garden tub and MUCH more! MLS#3473446. Lennar Sales Corp.
Only 10 homes in subdivision and no HOA. Certain deed restrictions apply. MLS#3469359. Laureate Realty.